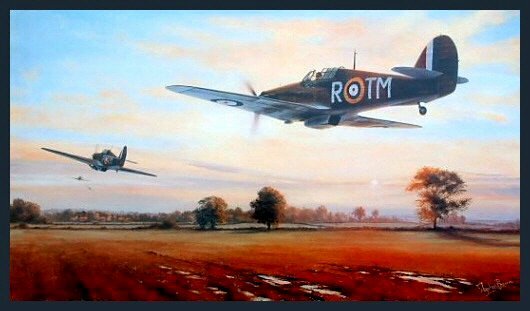 Hurricane Mk1s of 504 squadron shatter the silence of the English countryside as they power into the dawn sky. For the highly courageous but weary pilots it is the first of what will probably be several scrambles in a typical day during the Battle of Britain. During the long summer of 1940 Southern England formed the battle line upon which the future of the free world hung in the balance. Heavily outnumbered, the rugged Hurricane and its determined crews bore the brunt of relentless attacks by the Luftwaffe. Despite lacking the sophistication of the Spitfire or Me109, the Hurricane was an excellent aircraft, well loved by its pilots. It was rugged, stable and could absorb a lot of punishment and keep flying. During the course of the war the Hurricane flew in every combat theatre and in virtually every role conceivable for a fighter.